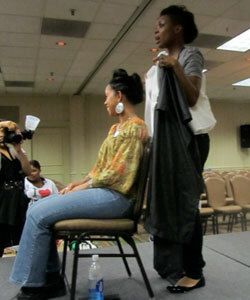 Atlanta, GA - "I am going natural because I want healthier hair. My hair wants to be curly and I want to set it free." 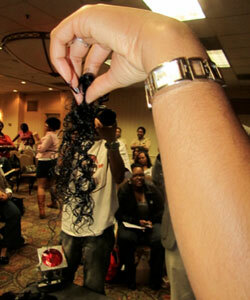 That was how Michele Seay ended up on a stage, surrounded by dozens of women who wanted to be a part of her Big Chop. 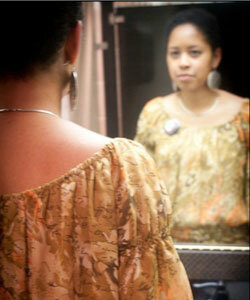 More than two years after her last relaxer, she was ready to take the final leap. Seay was in good hands, with texture specialist Key Martin in charge. 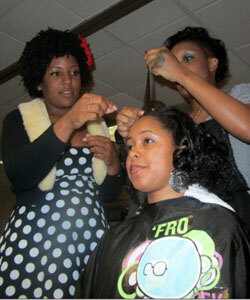 Martin, who works at Atlanta's Beautiful Dollhouse Salon, started off by "letting her hair talk to me." She felt her hair, looking for the demarcation line between the relaxed hair and the new growth, feeling the different textures. Then she took out her shears—the point of no return. The emotional moment brought tears from some in the audience, and the first cut brought a loud gasp and cheer as everyone showed their support. Flashbulbs went off in all directions as the crowd captured the moment. Seay held the strands in her hand, letting them drop to her lap. 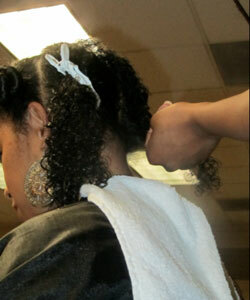 Throughout the next hour, she cut off the relaxed hair and shaping the new growth. She wanted a Halle Berry look that she could wear curly or spiky. Before she even saw her new look, Seay declared "I already love it." Stylist Key Martin and blogger Cassidy Blackwell feel Michelle Seay's hair before the Big Chop. Key Martin takes out her shears and begins to cut. Key holds up the first strands of hair. 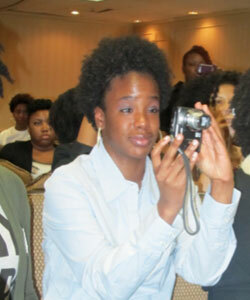 Michelle Seay's Big Chop was an emotional moment for this onlooker, who snapped a photo. 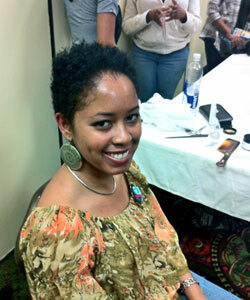 Michelle Seay loves her new natural look after the Big Chop. The crowd shows their approval as the Big Chop comes to a close. Michelle Seay sees her Big Chop for the first time: Photo courtesy of Erika Collier. 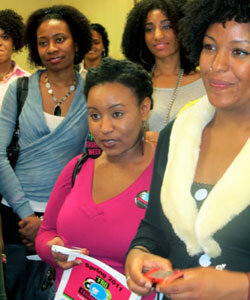 MORE: Curl Stories: Big Chop Success!